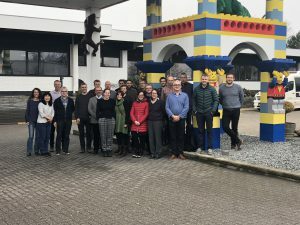 The EU-supported research project GplusE held its annual meeting on March 22nd-23rd in Billund (Denmark). 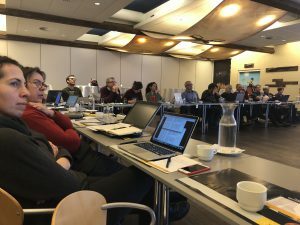 GplusE is in its fifth and final year and the discussion was focused on finalising the last studies, sharing on the last results and the best way to disseminate and implement the results. GplusE is about bringing new tools for selection and management of dairy cows in view of improving the health, welfare and productivity of the animals, with particular emphasis on finding out animals that are in preclinical metabolic imbalance. The new tools are based on markers that can be measured in milk at a low cost. A new approach based on clustering animals on the basis of metabolites measured in blood has been developed to establish 3 categories of cows that differ on the nature and extent of the metabolic imbalance they are experiencing. Thanks to an extended collaboration with private organisations in several European countries, milk-based markers are measured in a high number of cows that are individually classified into one of the 3 above-mentioned categories. Statistical analyses is conducted to find out the best combinations of milk-based markers that can accurately predict the metabolic status of individual animals. Blup models are set-up to include the newly found markers in selection strategies. Finally, new management tools based on HACCP and EVOP approaches and including the newly found markers are developed and investigated in commercial dairy herds in Denmark. Candidate genes corresponding to the identified phenotypes are actively sought out, and the corresponding annotations will be included in the BovineMine data mining warehouse hosted at the University of Missouri in USA. The results are disseminated in the scientific community via publications in scientific journals (Journal of Dairy Science; Animal; Animal Production Science; Irish Veterinary Journal; Oncotarget; Genome Research; Journal of Animal Science and Biotechnology; Genetics, Selection, Evolution) and communications in scientific meetings (69th Annual Meeting of the EAAP, 27-31 August 2018, Dubrovnik, Croatia; 22nd ESDAR Conference, 27-29 September 2018, Cordoba, Spain; 15th International Symposium of Veterinary Epidemiology and Economics, 12-16 November, Chiang Mai, Thailand). Two videos are also being prepared, one targeted to the general public, the other one targeted to farmers and dairy chains, to explain the economic, societal and environmental benefits that will result from the research conducted in GplusE. Finally, EAAP will organise two training schools during the last semester of 2018 where the trainees will be taught the basic knowledge relevant to the topics of GplusE and the main results obtained within the project.